KEITH ROWE: THE ROOM EXTENDED – Brian Olewnick (2018) | Weighing a pig doesn't fatten it. 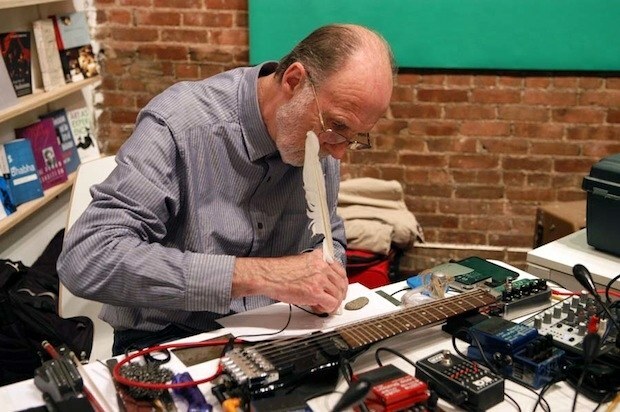 Rowe is still active, and besides his involvement with AMM and the later MIMEO, also performed and recorded solo, as well as in collaborations with among others Oren Ambarchi, Christian Fennesz, John Tilbury, David Sylvian, Otomo Yoshihide, Axel Dörner, Sachiko M, Taku Sugimoto, Toshimaru Nakamura, Radu Malfatti, Graham Lambkin and Michael Pisaro. Over 12 years in the making and via exhaustive research and exclusive interviews Brian Olewnick has traced Rowe’s life from childhood through the present, with focuses on London’s mid-60s experimental music scene, the political unrest of the late 60s, the radical politics of the early 70s, the ongoing saga of AMM through the 90s and the accompanying advance of creative music over that time period, centered around Rowe’s participation in those events and his major contributions to the contemporary avant-garde environment. 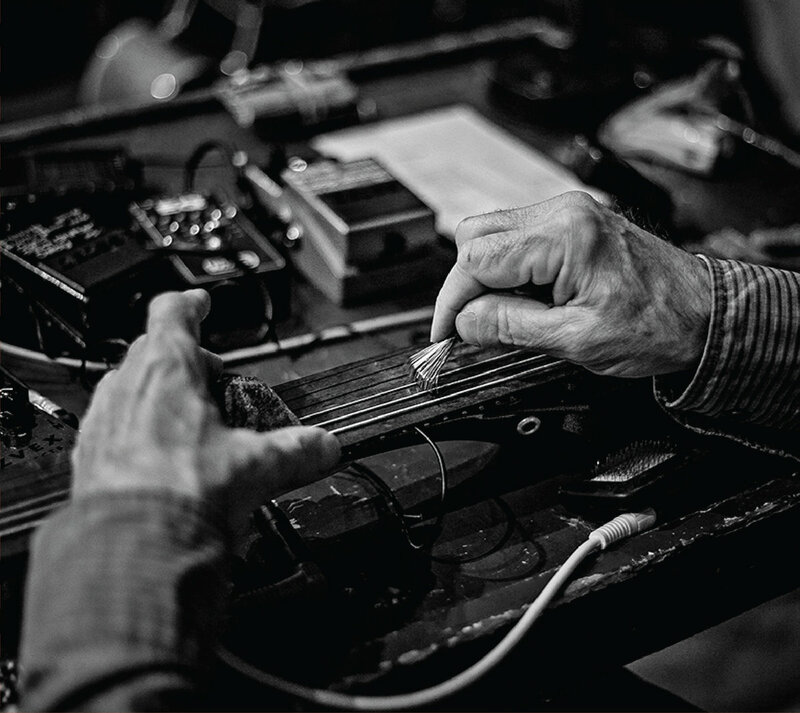 Through the many ups and downs of AMM and beyond, Rowe has become an éminence grise to generations of musicians and is still today continuing to push the boundaries of what is possible in the world of sound. Keith Rowe: The Room Extended is an artistic biography, so do not expect a lot of private information. Rowe’s marriages, him being a father and his day jobs are mentioned, but generally only in passing. The focus is clearly on the ideas and the artistic community Rowe is part of. The bulk of this book is a history of AMM. The second important part of Rowe’s career – his solo and collaborative work outside AMM – starting somewhere around the turn of the century, is only dealt with rather briefly at the end of the book. If I’m honest, I would have liked this to be more in balance. For me, Rowe has been making his best work this last decade, in his 70ies – something that’s exceptional in whatever art form. I’m guessing the reason for this decision is that Rowe’s late history is much more easily available online. Still, a bit more behind the scenes information – like the telling anecdote on how parts of his 2010 duo recording with Radu Malfatti came about – would have increased the value for us listeners immensely. So – AMM. Is there enough drama there for the mere casual experimental music fan to enjoy and be persuaded to buy this book? Is there enough history for the general art theorist to do the same? You betcha. Rowe and AMM were indeed radical and extreme, and the searching honesty of Rowe’s practice easily remains an inspiration for all those interested – and I don’t only mean an interest in music. David Grubbs is quoted on the back, saying that Olewnick’s book “brings home the fact that much of what you know about this crucial artist likely contains significant gaps.” And indeed, while reading it struck me how naive I had been in 2008, when I helped put up a performance of Rowe in Antwerp. I was invited backstage and had a conversation of about an hour with Rowe, asking intellectual questions about this and that and the ethics of art, failing to see how profoundly Rowe had already tried to deal with all that, 40 years before my youthful ruminations. Not that his thinking and his praxis stopped evolving at the end of the sixties – on the contrary, as Olewnick’s book shows. Still, I don’t know if I would have the patience at 68 to be a gentleman to a bratty 28-year-old, and allow for a genuine, patient conversation. Olewnick’s book is brutally honest, and that is on account of Rowe himself. The way Olewnick writes about Rowe’s mother can only be informed by what Rowe told him about her, and it is an early sign of how this biography is critical and conscientious, and doesn’t flinch when the lights are turned on – at times showing a stubborn, arrogant seriousness that many would find problematic. I have no idea how readers unfamiliar with AMM’s music will experience an another important part of the book. There are fairly detailed descriptions of key albums and some unreleased recordings, reminiscent of how Olewnick reviews music on his blog. Writing music history obviously can’t do without writing about the music itself, and Olewnick does a truly fantastic job translating the sounds into words – his prose is excellent throughout the entire book by the way. Still, while these review parts prompted me to pull out some of the records and listen to them again with new ears, I’m not sure about their effect on the uninitiated, and my hunch is that for some these sections might be a bit too long and repetitive. Formally, the book is written chronologically. It starts with a beautiful, poetic prologue, visualizing Rowe’s concept of ‘the room’ – showing his music to be fundamentally, viscerally connected with the world, the opposite of some abstract, disconnected form of intellectualism. It ends with a description of Rowe’s magnum opus, the 2016 quadruple cd The Room Extended – one of my desert island discs. There’s a few appendices – an 1974 interview with Prévost, Rowe’s notes to a performance of Cornelius Cardew’s graphic score Treatise, a text on Rowe by Lutz Eitel, an interview with Rowe from The Wire – and a postscript by Rowe himself. There’s also 16 pages of black and white photos – budget restrictions prevented the inclusion of color reproductions of some of Rowe’s paintings, but luckily you can easily find the covers for the albums he painted online. The 499-page book ends with a 40-page discography/videography, with a lot of links to online videos. There’s an 8-page index of persons, but no bibliography – although the text’s countless sources are always credited in footnotes throughout the book itself. 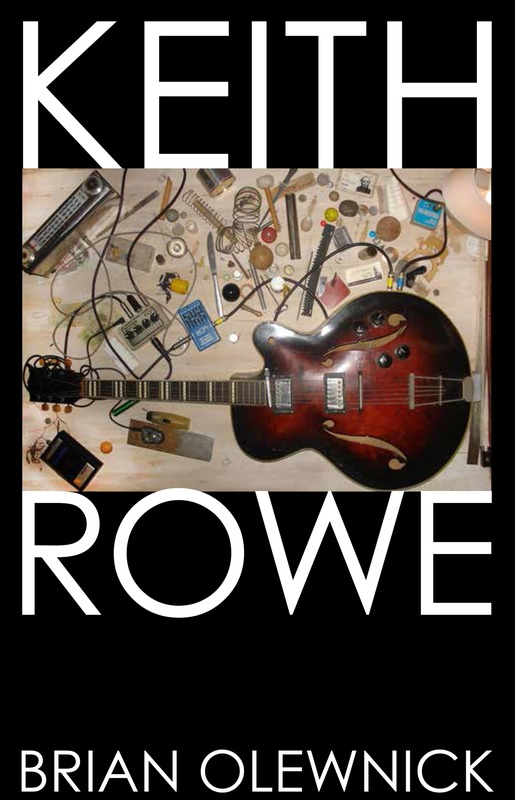 I enjoyed reading Keith Rowe: The Room Extended immensely. I learned a good deal, and it deepened my respect for Rowe, both as an artist and as a human being. People with a serious interest in experimental music unfamiliar with AMM or Rowe should investigate if his music clicks with them. If it does, and if they also care deeply for the artistic, intellectual and political history of the music they enjoy, they will end up reading this. People who only listen to mainstream radio or the Starbucks’ Spotify playlist have no idea. Music can go beyond rhythm, and melody, and harmonics. Not that it needs to. But it can. This is not intended as paternalistic snobbery. Obviously not everybody will like this kind of music, just as I don’t like lots and lots of stuff – experimental or mainstream or metal or whatever. Most art usually doesn’t click, so it doesn’t make a lot of sense being proud about what happens to click with you. But my hope will always be for people to lose their straitjackets, and find something beside the common denominator of commercial produce. This is not about proudly whispering esoteric secrets either, as there are countless of styles and underground circuits of which I have absolutely zero knowledge. Because of cheap recording methods and virtual distribution and worldwide urbanization, scenes seem to sprout at an unseen pace, and only get more and more fragmented. So it doesn’t make a lot of sense being proud of the island or archipelago that coincidentally floated your boat. 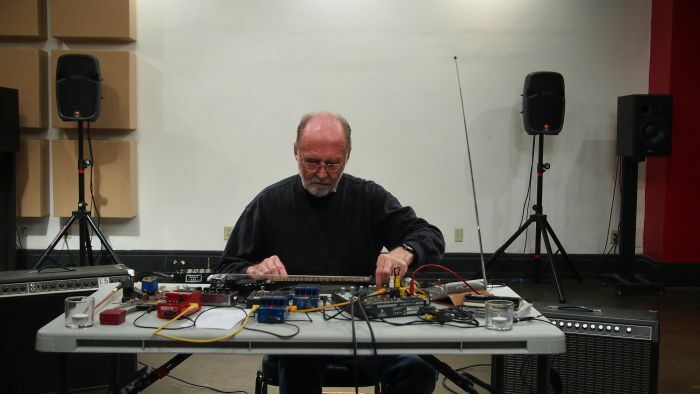 There is a ton of other music out there, and what experimental music like Rowe’s fundamentally does is open up possibilities. It is a radical, positive force that helps alter our perception of things. It’s effects are hard to prove, and maybe futile in the bigger picture. Maybe all art serves imperialism indeed. Be that as it may, on a personal level it unmistakably does work – if only to replenish the soul, and keep our senses keen. However naïve, my hope will always be for people to lose their straitjackets, opening up the world to a better version of itself. So yes indeed – a messianic review after all. This entry was posted in Reviews and tagged AMM, Brian Olewnick, Experimental music, Keith Rowe, Keith Rowe: The Room Extended, Music, Non-fiction. Bookmark the permalink. A very interesting review, about a very intriguing book and an even more interesting person, it seems :). I’ll definitely check out Rowe’s recordings now. I prefer the final version of your review, btw, simpler and more humble, and somehow seemingly more suited to the topic. Thanks! Yes, the coda is overdone indeed, but I kinda liked its pathos, and I wanted to say something about the relation to mainstream music, so I decided to put it in. I stand by its content, but at the same time it’s a bit ironic too, a wink at a certain kind of discourse. Do let me know if you like Rowe’s music. If you’re totally unfamiliar with stuff like it, it might need a bit of time, not a mere ten minute sample. Glad you “liked” it! Yes, music like this has the tendency to be a certain presence in a room, blending in, highlighting other sounds that occur too. It also works on headphones for detailed listening, and that’s a completely different experience. If you want a different side of Rowe, the live duo with Beins is much denser, and fairly short 30 or 40 minutes, and as such a bit easier to grasp than The Room Extended. I was hoping you’d review this when I saw you were reading it; great album recommendations as well, thanks! My pleasure! Thanks for the comment, appreciated!